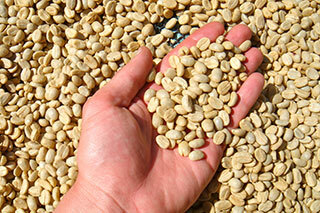 Our producing partners are more knowledgeable about cup quality than ever before. While most farmers and cooperatives have long established QC systems throughout the production stage (harvesting, processing, and sorting) fewer have been set up to fully evaluate coffee in a cupping lab. Despite massive exports, many coffee producers do not have a strong coffee consumer culture within their own society and even less, a discerning coffee palette. However, as producers have more access to information, partnerships, and constructive discussion with buyers, they are acquiring additional tools to improve their quality analysis all the way to the cup. Many producer groups are also investing resources in cupping facilities and training for lab technicians. To assist in this development OPTCO organizes training sessions, roasters visits, and covers travel costs to trade shows on top of establishing regular feedback and dialogue about coffee quality throughout the harvest. This means a clearer understanding about quality between everyone along the coffee chain and pushes all of us to supply the best product possible. 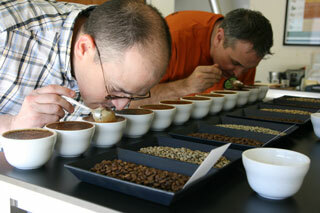 The OPTCO cupping team has been evaluating every coffee that comes into our lab since 1990. A supplier sends us a pre-shipment sample that we analyze at different roast levels to accurately detect any defects or anomalies, as well as the more specialized nuances of the specific origin. 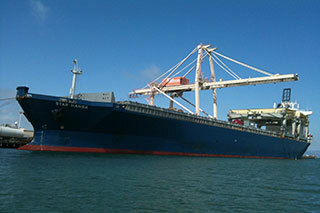 We repeat the evaluation process with an arrival sample once the shipment lands. This protocol allows us to stand by the quality of our product, provide clear feedback to producers, and help match the right coffee with each roaster’s desired profile. Our goal is to supply our customers with the best specialty coffee that fits perfectly into their line-up.